It’s not an official holiday yet, but June 30 has been declared ‘Logan Day’ by one very happy family. It is to be celebrated annually by getting a new fish. 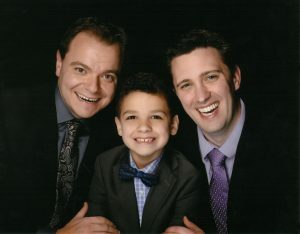 On June 30 of this year, eight year old Logan celebrated one year living with his dads and their dog, Finnegan. To mark this milestone, the whole family went to court to make it official: Aaron and Jeremy are now legally Logan’s dads. Logan with his dads Aaron and Jeremy. Last year, June 30 was the first day of Logan’s adoption placement. Logan chose the first day after the school year ended as the day that he would move into his new home. He chose that day because he didn’t want to waste any time; he was moving the first day he could. ‘Logan Day’ was further enshrined when, after a year on adoption probation, it came time to request a court date to finalize the adoption legally. The family asked if June 30 was a possibility. As luck would have it the courts obliged given it was such a meaningful date. Logan has three biological brothers and the plan was that there would be an openness arrangement with all the boys and the boys’ biological parents. What makes this story remarkable is the extent to which everyone has embraced the openness agreement. It is required that openness be considered for all public adoptions in Ontario. That openness can look very different depending on the specifics of each situation. It can range from exchanging letters or pictures, with no personal contact, right up to regular visits. In Logan’s case, the entire extended family is embracing openness to its fullest extent. Aaron and Jeremy met Logan’s biological parents at their last visit with him. They acknowledge it was awkward, but building and maintaining those ties was more important. Having them give their blessing to Logan was an amazing gift. Everyone truly has Logan’s best interest at heart. Each of the brothers is in various stages of their adoptions. The adoptive families for each of the boys along with their biological parents are all committed to sharing letters, video chatting and visiting in person. They are opening their hearts and families for all the boys. Everyone involved knows that a strong support structure and family connections are in the boys’ best interest. That support will be fundamental to the success of each of the adoptions and in ensuring a bright future for all the boys. Despite their fears and logistical challenges, everyone remains committed. Logan’s foster parents, Lucy and Dave Hudson are also key players in their journey. Their support and especially Lucy’s assistance in planning was instrumental in ensuring a smooth and healthy transition as Logan moved into his new home. Sadly, Dave passed away last year, after Logan had moved. Logan faced that sad event courageously with the help of his family. Before his adoption, Logan’s forthright character was apparent when he was asked what he wanted in his future adoptive home. He said he wanted to live on a quiet street with a paved driveway. He wanted to still eat grapes. And he stated confidently “I want a good life.” He hasn’t got that paved driveway yet, but he certainly does have a good life.